All transactions are safe and secure with a reliable history in online purchasing behind each of our associates. Buy the Grey's Anatomy Logo t-shirt to own Grey's Anatomy clothing and merchandise. If you like your hospital dramas with a little steamy (and dreamy) romance thrown in, then the Grey's Anatomy TV show is the perfect prescription. This design displays a red and white logo that will instantly resonate with fans. Available in a variety of styles, these Grey's Anatomy t-shirts are a simple way to express your love for the prime time surgical soap opera without paying tribute to a specific character or quote. 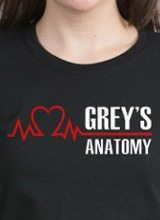 In addition to the Grey's Anatomy Logo tee above, browse the Grey's Anatomy Clothing Gallery for more apparel like men's and women's clothes, kids shirts or hoodies.